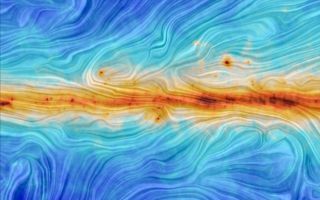 This visualization of data from ESA's Planck satellite, reminiscent of the soft tones and delicate quality of an artist's painted masterpiece, presents a view of interstellar dust interacting with the structure of our Galaxy's magnetic field. This visualization of data from ESA's Planck satellite is reminiscent of the soft tones and delicate quality of an artist's painted masterpiece. The image presents a visual of interstellar dust in the Milky Way interacting with the structure of our Galaxy's magnetic field.